State officials joined hundreds of other dignitaries Saturday in celebrating the unveiling of the Texas African American History Memorial at the Texas Capitol. Saturday's unveiling of the Texas African American History Memorial at the Capitol could have been a somber occasion – a reflection on centuries of slavery and legalized oppression. Instead, it was a moment of rejoicing for the hundreds of guests, who celebrated how so many had overcome deep struggles and how the event appealed to a better future. 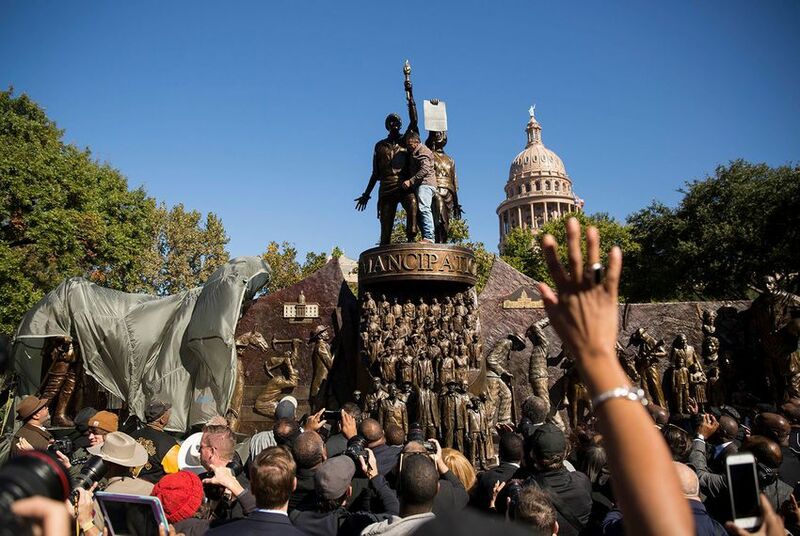 State officials and other special guests, including benefactors, revealed the memorial on the south lawn of the Capitol, a feat that comes more than two decades after lawmakers first pushed for the bronze and granite monument to African-Americans in Texas. "This has not been an easy journey," said Houston Mayor Sylvester Turner, a former member of the Texas House who helped secure funding for the memorial. "And I'm not referring to the raising of money or to the construction of this monument. I am talking about the history of African-Americans of the state of Texas and where we are today." Turner said that while many often focus on current struggles, it's important to look back and see how far the state and its residents have come. The journey "began a long time ago in this state. And look at where we are today. I think that speaks volumes." The 27-foot high, 32-foot wide monument depicts Juneteenth – June 19, 1865 – when hundreds of Union troops arrived in Texas and announced the freedom of slaves in the U.S., along with major social, political and cultural icons in the state from years later. The structure also portrays the cattle, cotton and oil industries and black Texans' role in advancing them. Ed Dwight, a Denver-based sculptor, proposed the monument to mark the history of black people in Texas, a history that pre-dates the United States. Dwight had three jobs, said Bill Jones, chairman of the Texas African American History Memorial Foundation: create a memorial that is historically accurate, aesthetically pleasing and has emotional impact. "He has done all three," Jones said. "And he has done so beautifully. What he has created will walk you through Texas history, that will include the contributions of Africans and African-Americans to this state's rich past." In the last four centuries, black men and women in Texas endured slavery, a civil war and segregation – a history that sometimes overshadows the community's contributions to politics, science and the economic powerhouse that the state has become. Gov. Greg Abbott said Saturday's unveiling ensures the recognition of moments in Texas history that have not been fully acknowledged. "To know where we are going in life, we have to understand where it is that we have come from. The triumphs, the tragedies, the lessons that we learn along the way," he said. "They are a legacy for the generations that are to come forward in the future. But chapters have been missing from the story of Texas. That changes today." A previous plan in place aimed to build a statue commemorating Juneteenth, but in 2012 – after more than $1 million was already spent on the project – the effort was scrapped after critics noted that the statue closely resembled a legislator who had helped pass the law authorizing its construction. Lawmakers went in another direction: The Texas African American History Memorial. "We owe so many an enormous debt of gratitude for speaking up and speaking out so that this important moment was possible," said state Rep. Helen Giddings, D-DeSoto, chairwoman of the Texas Legislative Black Caucus. "Many may not realize that one of those who deserves our gratitude is the 43rd president of the United States and our former governor, George W. Bush." She noted that as governor, Bush signed legislation that directed the Texas Preservation Board to plan for a monument in tribute to African-Americans. He also allocated money for the planned Juneteenth monument, "which was critical in moving us to where we are today," she added. The current project carried a $3 million price tag. The Texas African American History Memorial Foundation raised some of the funds, while lawmakers authorized $1.5 million to cover the remaining costs. As Saturday's ceremony neared its conclusion, White Lives Matter demonstrators could be heard chanting down the street from the Capitol. Organizers had said in the media that their protest was not inspired by the memorial's unveiling but a coincidence. As the ceremony wrapped, some guests stayed around the monument and took pictures or walked toward the reception area on the other side of the lawn, while some ventured toward the protesters and counter-protesters. Following two decades of effort by lawmakers to install a monument at the Capitol celebrating African-Americans, the main components of a bronze and granite memorial were quietly lowered onto the south lawn on Tuesday. After more than 20 years of efforts to place a monument to African Americans on Capitol grounds "littered" with Confederate tributes, state lawmakers have approved $1.5 million that should bring the African-American Texans memorial monument to fruition.